Next, you are ready to enter the full details of your transaction. Make sure that your Property Details are complete with exact street address, year built, brand affiliation and classifications. Choose from the available dropdown/autofill as often as you can. For example, choosing the right brand from the autofill/dropdown will automatically select the right Property Type for you. In the Transaction Details, complete as much information as you are able to share or reveal. First, set the Transaction Status. If it is a brand new listing, start with Active or Call for Offers; as the transaction progresses come back here and keep it updated all the way to either Closed or Delisted. If you would like to set a guide price, enter it in Sale Price. If there is any guidance on expected PIP or capital needed, enter it in Projected Capex Amount. In Owner’s Broker, enter only the firm/entity that has the assignment, like CBRE, Avison Young, JLL, etc. 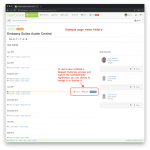 You will have a chance to highlight your and your colleagues names in the Description field or via the Tag feature later. Use the autofill/dropdown options as often as you can, if you see a match. If you can share who the seller is enter it in Owner(s)/Owner Type. Again, these should almost always be entity names. Use the autofill/dropdown options as often as you can, if you see a match. If a transaction involves multiple properties, you have to enter each property individually. Then, you can link those properties via the Portfolio Information field. If the transaction is part of portfolio sale, choose Yes. If naming the portfolio for the first time (first property entered), chose [Create Portfolio Name] option in the dropdown and enter the name in Portfolio Name field. On subsequent transactions, simply find the entered portfolio name in the list of Portfolio Names to associate that transaction with an already created portfolio name. The Description field is your chance to detail the investment opportunity to any interested parties. Start with a description of the property, give detail on any transaction particulars like in-place franchise or management agreement restrictions, new brand/capex requirements, or financing encumbrance. You can also explain the market and any demand drivers. Finish the Description field with a list of the brokers that are handing the marketing of the transaction. 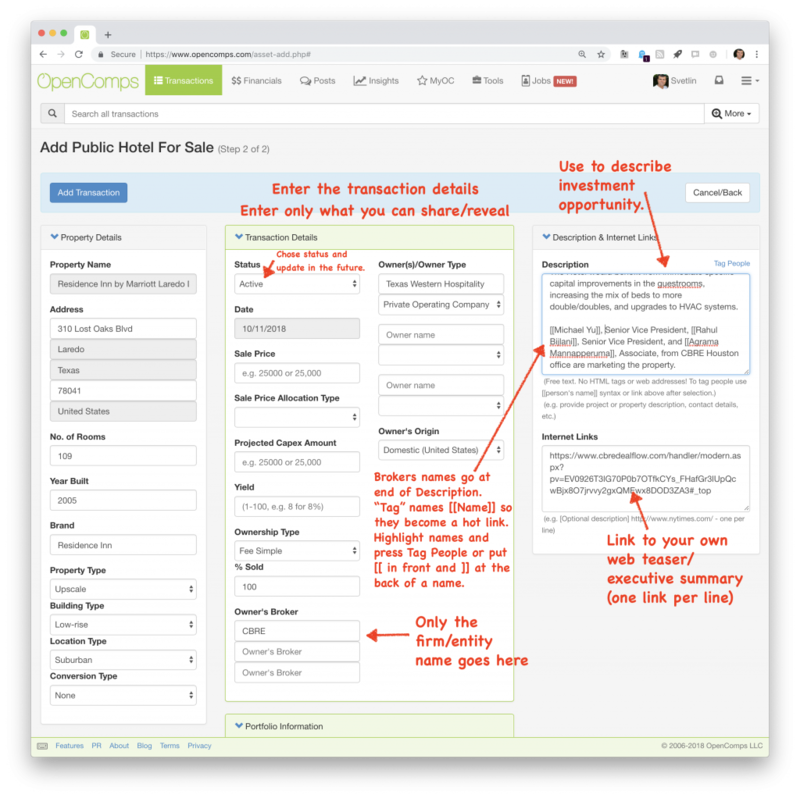 Provide just names and avoid giving telephone names and/or email addresses as an OpenComps transaction is a permanent record of the event, i.e. it doesn’t get deleted or removed, so things that can date over time should be avoided. 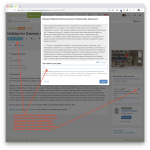 For contact purposes, we’ve build a large user tag and Request Materials process that users can use to get in touch with you. People names in the Description field should be “tagged” by enclosing the name in double brackets like this [[First Last]]. You can either highlight the name and press the Tag People button or simply type the brackets. People names that are so tagged will become hot links that users can click on to quickly search and display other transactions where the person appears in the Description/Notes field. Click the Add Transaction button when done. 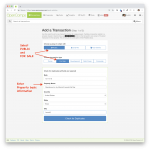 Don’t worry, you can always hit the Edit button on the transaction view page and make any corrections. But do note that once a transaction is entered into OpenComps, you won’t be able to delete it. If this is really necessary, please get in touch. You are almost done with your for-sale listing. Lastly, and very importantly, don’t forget to Tag yourself in it. Choose the Tag button and select Owner’s Broker. This will create a nice, large user profile box associated with the transaction that makes your role clear and other users can quickly get in touch with you. 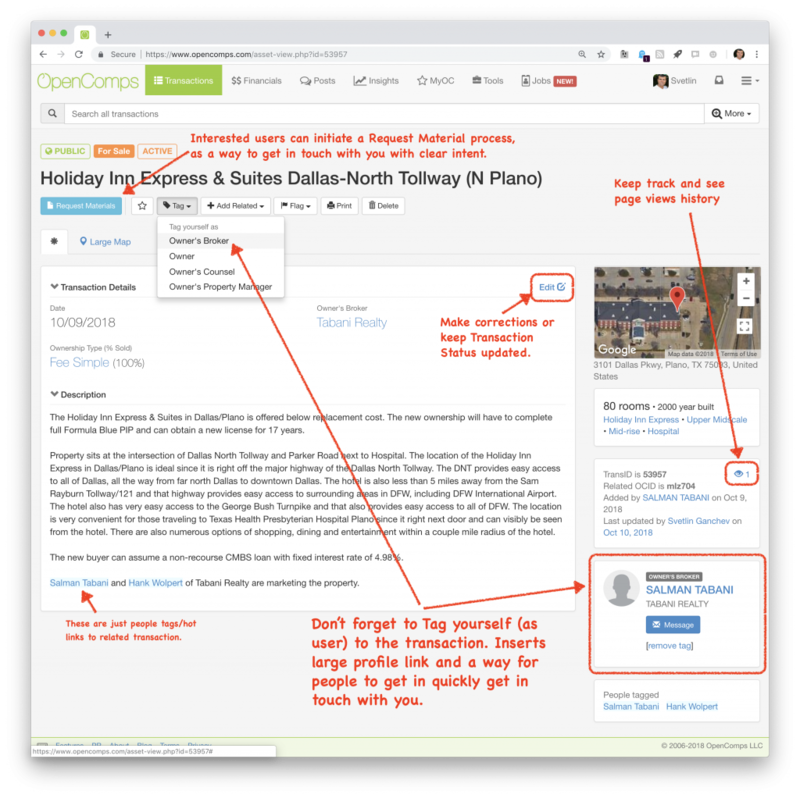 If you keep your contact information current with OpenComps, users can always get in touch with you via OpenComps messaging system, instead of email address or phone numbers that may become obsolete. Your colleagues can also Tag themselves in the transaction, so everyone in your team can be highlighted and reachable. If you need to make any corrections to your transaction, hit the Edit button. Please, keep the transaction up-to-date by continuously updating the Transaction Status as you move along your process – from Active/Call For Offers to In Contract/Closed/Delisted. Users that are interested in your transaction can initiate a Request Materials process by clicking on the pale blue button. This will present them with a pre-set, generic Confidentiality Agreement that they have to agree to by writing their name or initials. You will be notified when a user completes such Request Material process. You will then have an opportunity to accept or decline their request in the transaction’s page views history page. You can then engage in direct communication with the interested users in delivering additional materials pertaining to the investment opportunity. The transaction’s page views history page also gives you an opportunity to review a list of users that have looked at the opportunity. You can then choose to follow up with them via OpenComps messaging system, even if they haven’t initiated a Request Materials process. Your new transaction will be available in full detail to ALL users of OpenComps (subscribers and non-subscribers). Users will see your transaction organically as they browse or search the site. Your transaction will also get highlighted in the For Sale section of the daily and weekly newsletters that we send. 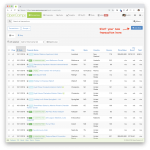 We hope that you soon take advantage of this OpenComps feature. 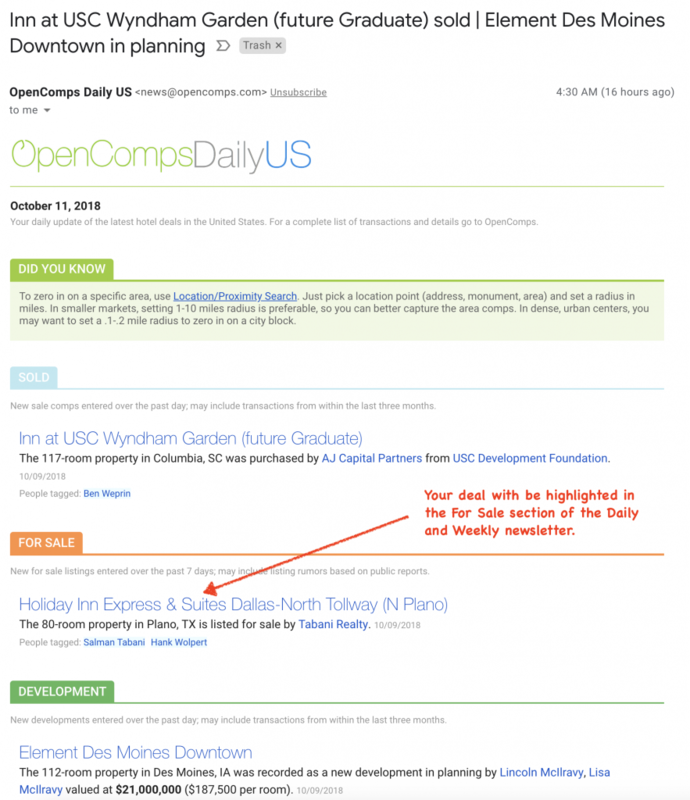 Entering your for-sale transactions in OpenComps can bring you additional, high quality leads as well as highlight your expertise and deal making capabilities.